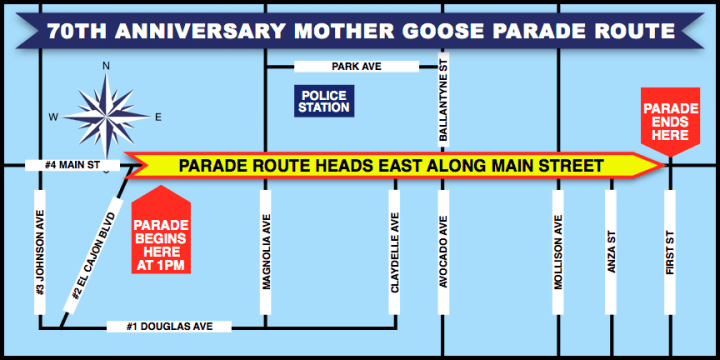 Please join us on Sunday, November 18th for the 72nd Annual Mother Goose Parade!! This free family event is an east county HOMEGROWN tradition. The parade will begin at 1:00 p.m. and goes until approximately 4:00 p.m. This year the parade route and road closures are slightly different. The parade will start at the intersection of Main Street and El Cajon Blvd. It will travel east on Main Street and conclude at the intersection of First Street and Madison Ave. Please see below for a list of road closures.